15th century princes from the Loire Valley devote their efforts to strategic trading and building in order to bring their estates to prosperity and prominence. Over the course of 5 rounds, collect the most points by trading, livestock farming, city building and scientific research to win! Castles of Burgundy is a fun Euro styled game where you play the role of a price expanding this kingdom. However, as the case in most Euro games, the theme is pretty thin. And while there is no actual “storming of the castle,” that does not stop this game from being a fun mind bender as you grow your land. When we started playing this game and the rules were explained to me, my head was spinning. When you sit down to do the same be ready to be overcome with lots of details. Take a deep breath, its ok. Once you dive in you’ll start to get it and everything will be awesome. I’ll try to share some of this with you now, brace for impact. The main bulk of rule explanation comes from the many different tiles that are the main focus of the game. These are the tiles you use to add to your kingdom and see it grow. There are six different tiles and each one has a different benefit. It’s not necessarily each of these tiles that make the game a little complex, but the focus should be on two tiles, the knowledge/science tiles and the building tiles. While the rest of the tiles have one specific function, these tiles are a little special and each one is a little different, providing you with unique abilities that can separate you from the group. The game is set up with a buying market where land tiles are placed into groups one through six. If you want to select a tile from group four, then you need to have a die roll with a four on it. On your player board you have a land mass you are trying to fill with different colored spaces and numbers on them. The colors represent the type of tile that can go into that space, and the number represent what roll you need to fill that space. At the start of the turn the players roll their dice and this shows the players what selections from the market are available to them or what spaces they can use on their board. While some may not like this use of dice in a Euro game, the luck factor is narrowed. For one you have worker tiles you can spend to influence your die roll. Additionally there is always something you can do with what is rolled. I have never felt like I missed out on something because of a bad role. The game progresses through five rounds that replenishes and replaces the tiles in the market area after each round. There is also a little economy involved in the game as you mine for silver and also can trade/sell your goods for VPs and silver. The silver can be used to purchase tiles from the market, but these tiles are only available through purchase. •	There are several player boards that I think will add to the replay ability. Once you think you have a map down, you can change it and the way your kingdom is built will be completely different. •	I’ve seen this game online for under $40. A game you can add to your collection with great replay ability and strategic game play for under $40 is a great game. •	The game is only playable with 2-4 players. That is pretty limited to me and I prefer games with more options for players. For me this is the biggest knock on the game. •	The rules may come over you like a tsunami. This is not a game for new gamers, so make sure you know who you are playing this with. However, don’t let this stop you from playing. If you can get past the rules and are willing to sit down to actually play the game, it makes more sense and will not be over your head. •	Again, know who you are playing with. This game can cause paralysis by analysis. At the same time, make sure that you are not the one slowing the game and giving the other players a bad taste for the game. I know that I have a pretty balanced pros v. cons, but the more that I think about this game the more I want to get it back to the table. Not only play again, but this is a game that I would love to own. I love how this game is deep, but not deep enough to drown people. It takes a bit of time, but not so much that your whole night is lost. There is a bit of luck, but not enough to ruin your game. All in all it is a greatly balanced game that will stretch many with its diverse strategy. I thought Castles of (Ron) Burgundy would be a nice step-up from Settlers of Catan and I was right. The game is great fun, even though it’s not an action packed adventure with Forbidden in the title. I love cause and effect in games, and you can feel that happening as you build you kingdom. This game is reminiscent of Settlers of Catan. It’s not drop dead gorgeous, but it’s pretty and it get the job done. After a few games, you won’t need the rule book anymore and the game will become entirely visual-driven. The main game board that all resources come from is nice and the design works perfectly with the game. Your own personal map is somewhat bland, but you fill it up with hexes and goods soon enough and it starts feeling extremely satisfying as you build your little kingdom. Beautiful, not really. But it’s easy on the eyes and helpful to the players. I believe this is a good step-up game for people. After few games of Catan, Castles of (Ron) Burgundy seems like a natural move. This isn’t a game for people who need tons of action, but people who like peaceful pacing but stressful choices. Think of it as building a puzzle with friends. Except, one of you can win! It makes a great two player game as well, so if you need a game to accommodate less people, this works great. I found this at Barnes and Noble in the discount bin and it’s one of the best finds I’ve had. My wife really enjoys this game and she tends to beat me by a good margin of points. But it’s still fun and it is really fulfilling to complete certain sections of your map, it’s a tangible, growing marker of your progress and success. Plus, in five rounds, it doesn’t over stay it’s welcome and I can’t wait to introduce it to more people. Castles of (Ron) Burgundy is a buy! In Castles of Burgundy, you and your opponents are 15th century princes from the Burgundy region of the Loire Valley in Central France competing to bring your estates prosperity and prominence through strategic trading and building. Castles of Burgundy is very much a Euro game. While the theme puts the player actions into context, it is not very deep and the game mechanics are not restricted by the theme. Play entails set collection and tile placement and there are numerous ways to earn victory points. Additionally, player interaction is limited as time is spent quietly contemplating and strategizing your route to victory. That being said, Castles of Burgundy is a delightfully addictive game that combines a little chance with a whole lot of strategy. At first glance, the game looks incredibly complicated to learn with its many pieces and cryptic boards. However, the straight forward mechanics of the game are easy to learn. 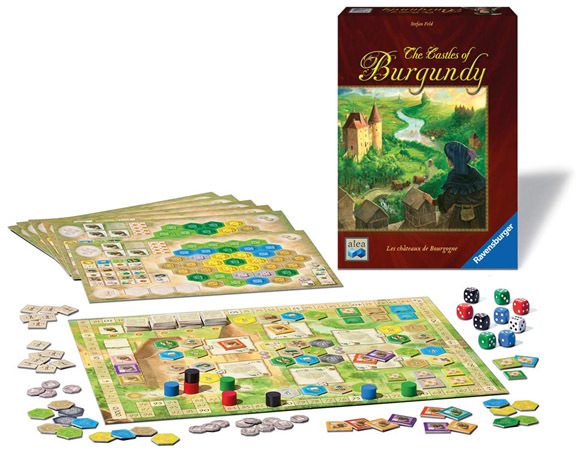 Castles of Burgundy is played in five phases, each phase consisting of five rounds. Each player has a mat consisting of 37 hexagonal spaces that together represent the estate you are developing. Also included on the player mats are spaces for dice, goods, silverlings (the game’s currency), workers, and six-sided tiles that have not yet been played. Additionally, the mats include a puzzling player aid that at first makes little sense, but after playing the game a couple of times, the meaning becomes clear and the player aid is quite helpful. The central game board has six numbered depots that hold both the six types of terrain hex tiles and the six types of goods that come into play as the game progresses. Why so many sixes? Dice. Each player has two dice that are the same colour as the player scoring pieces. At the start of each round, players roll their dice and use them to perform two separate actions based on the value of each die. Players are free to choose from four different actions; however, the values on the dice place constraints on how the actions are carried out. For example, if you roll a five on one die you can either gain a tile from depot five on the main board, place a terrain hex on a five space on your player mat, or sell value five goods. Before using a die to take any of these actions, you can use one die to gain two worker tiles. A worker tile allows you to adjust the value of a die up or down by one. Workers are a valuable resource in that they assist you in meeting your strategic goal, and at the end of the game, you gain one victory point for every two workers you have remaining. There are many different types of hex tiles, (knowledge, ships, mines, animals, castles and buildings) each offering something different that assists you in developing your estate. Keeping track of what each tile means can be rather confusing. For example, there are 26 different knowledge tiles, each with a different effect, and eight types of buildings that all give different bonuses. While the player aid on the mat helps to determine what some hexes do, it is not very detailed and not all inclusive. I found myself constantly flipping through the player manual to find out what the various tiles did. I found a solution to this problem on BoardGameGeek. Stephen Brinich, a BoardGame Geek member created a fantastic two-page cheat sheet that has pictures and descriptions of all the hex tiles. I printed and laminated several copies so that each player has their own quick reference player aid. This definitely simplified play! I have played this game with two and three players. Both work equally well, it just takes a little longer with three. Castles of Burgundy left me feeling like I had given my brain a really good workout – in a fun and positive way. It definitely requires a sharp mind and plenty of focus! The only criticism I have about this game is the colour scheme. The colours blend together in a way that sometimes makes it difficult to discern what hex tiles are remaining on the main board. Castles of Burgundy has immense replay value. A game is never the same twice AND it comes with nine different players mats for added variability. There have been a number of small expansions that add hex tiles and different player mats, but they are difficult to find. Overall, this is a fantastic Euro game that should not be missed! If you enjoy other Euro board games then don’t even think twice about getting this game. It is great fun! There are so many different paths to victory that everyone has a chance of winning. And I absolutely love the dice rolling mechanic in this game. It is so unique. Basically everyone gets two dice and they roll them, but instead of adding them up you use them to either  get tiles from the center board,  place tiles on your personal board (i.e. your princedom),  sell goods which get you victory points and money, or  trade a die roll for workers that allow you to adjust your die rolls + or – 1 point. That’s it. Roll dice. Choose 1 of 4 options for each die. Repeat. The object of the game is to get victory points by adding tiles to your princedom. Your princedom is divided into 6 different colored regions of varying sizes (1 – 8 hex tile slots). Each hex slot has a die number pictured on it that corresponds to your die roll. You can score victory points for placing different tiles, completing colored regions, or by selling goods (which also have corresponding die numbers pictured on them). This game is complex, but not complicated. And that is exactly what makes it so much fun! And once you’ve played a few rounds you’ll find that the complexity is not in the actual game play, it is in the vast array of decisions that you can make with every play. This is what makes me want to play it over and over. Every time I play I think of different things that I could have done to improve my strategy. This is a great game, and one that I highly recommend! As the title shows, I’ll simply explain what effect the dice have in this game as a strategic one, from my point of view. – The first thing I have to say is that the dice don’t affect much the strategy of the game and, even though luck could make some points of difference, the winner will be the one that has played best and not who has rolled better. – Playing with dice means that there is no way to control the “main resource” to buy things and because of that, even if a general strategy is possible to follow, adaptability is necessary in order to avoid wasting +/- modifiers and losing points. So the dice make the players making decisions each turn and don’t let to plan far ahead. – The dice make the last turn a little bit of a waste in some situations. This is sometimes a problem when a game ends in a certain amount of time instead of when someone achieves victory, but dice make it worse. Unless you save goods to sell or a last construction and some modifiers in front of you, is difficult to plan something as you can’t know which numbers you will have to use. As the last part of a game is usually the most important one to feel satisfied after playing it, this is one of the bad parts of the game. I personally like the game, and think that the way the dice work is well prepared. I love the theme and feel of the game. The artwork is decent but does a good job of setting the tone for the game. You are competing estates striving to build the best castle. Mechanics are solid.. my favorite being the ability to combo your building placement. That’s what really makes this game mechanically unique and sets it apart from a lot of other euro style games. There are times where you simply get screwed by the dice but that adds to the fun of it all… and that’s the only element of luck. The rest is pure skill, planning, and strategy. Great replay value. Super fun for 2 players but also great for 4. Game scales well from 2-4 players. Lots of replayability with different player boards. Multiple paths to victory that enable variable strategies. The dice mechanic allows players to make tactical decisions while still maintaining an overall strategy. Mostly independent actions but has blocking opportunities with a premium placed on player order to allow competition for the best tiles. Game is easy to teach to gamers that are familiar with eurogames and also appeals to family gamers as there is no player elimination. A Feld masterpiece. I Love this dice driven euro game by Stefan feld and ravensburger games. If your familiar with Stefan feld games than your not looking for a thematic experience here, but lots interesting decision and tons of strategic choices are packed into this game. My biggest problem is the length of the game. This isn’t a heavy strategy game (it’s more in the medium range) but a four player game could easily last 2 hours, but the doesn’t even detract too much because this game kept me engaged through to the end. There is a lot going on in this game but it is very easy to formulate your own strategy and go to it. The dice rolling mechanic in this game is very unique and works perfect as far as luck vs strategy. This game is an excellent social game, it takes a while to play but when it is not your turn there is plenty of conversation time. fun game. interactive with the ability to add some variety with both a base and optional player boards and this also provides great replay value. my first Feld game and we really enjoy it. The components are not as high quality as we see out there today but the aren’t terrible either. the color choices are a little odd and very bland. the card board is on the thin side but I have nothing warped. Add a Review for "The Castles of Burgundy"